This patent caught my eye because there's some curious lens designs discussed in it. Usually, we see full frame lenses with around a 21mm image height and a APS-C lenses around a 14mm image height. These lenses have an image height of 33mm. They could be discussing future tilt shift lenses, or discussing some other system. Since one of the examples is a 50mm 2.8, the lens elements do not match the current TS-E 50mm making this a completely new design. These lenses have a longer backfocus, so are possibly not mirrorless in nature. These are also not small lenses, with a total lens length of 143-150mm which includes the backfocus, or the lenses themselves would be around 100-105mm in length. This patent deals with a novel implementation of sharing an element group across two different lens designs, thus reducing manufacturing costs. Could this be new tilt-shift examples? 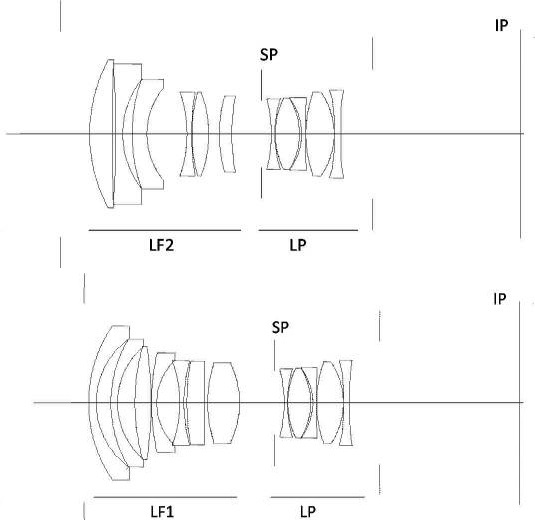 Could it be that Canon is looking at cost-effective methods of producing medium format lenses? Of course, with any of the patent applications we find, this is simply an area of Canon research, it doesn't guarantee that any product will be made.